Cost budgeting in a large company is an exhaustive process. A tremendous amount of detail and input goes into this iterative procedure where each senior team member brings a cost budget from his or her team and the finance leader integrates it and then negotiates with the senior team members to get the numbers where they need to be. Budgeting is a collective process in which each individual operating units or Cost Centers prepare their own budget in conformity with company goals published by top management. Since cloud is quite scalable and often teams exceed their budget or don’t have a clear visibility over projected spend which leads to budget mismanagement and overall havoc for IT Directors to re-evaluate budget and get the approval of the Finance department. Also, at times IT Directors wish if they were able to set budgets at a very granular level that could diminish any kind of uncertainty. This is where Botmetric’s Budgeting can help you create a comprehensive budget model. So, what is Enterprise Budgeting? Botmetric’s new feature ‘Budgeting’ under Cost & Governance, will empower the financial leaders in your organization to set the budget and track it with seamless workflows and processes. The two inputs imperative to the budgeting process in a large enterprise are, a detailed cost model for the entire payer account and a comprehensive cost model for individual Cost Center based on linked account(s) and tags. Who will benefit from Enterprise Budgeting? Enterprise budgeting is a powerful tool which will be helpful to senior level professionals such as CFOs, CTOs, IT-Directors, Head of Infrastructure & Engg, Senior IT Managers and more. Which Botmetric subscription plans have access to Budgeting? Currently, we are enabling the Budgeting feature for Professional, Premium and Enterprise plans only, on request basis. User: User workflows with write permission will be allowed to only set the budget which will then be sent to a financial admin for approval. Admin: Admin workflows/roles can provide the user with read and write access to budgeting. An admin can set the budget but only a financial admin can approve it. Financial Admin: A Botmetric admin can also be a financial admin whose role will be to define the budget goal in Budgeting and approve the budget set by other users. By default, the owner of a Botmetric account will also be a financial admin. A Cost Center can be a department or any business unit in the company whose performance is usually evaluated through the comparison of budgeted to actual costs. Previously, Botmetric allowed you to create a Cost Center using tag-keys like ‘owner’, ‘customer’, ’role’, ‘team’ etc. Now, as per extensive budgeting requirements, Cost Centers in Botmetric can be defined in two ways- based on tag keys alone and based on accounts and associated tag key-value pairs. Based on Tag-Key: Here, you can choose the tag key which corresponds to your cost center. Based on the chosen tag key, Botmetric will create all possible cost centers for the tag values corresponding it. Based on account(s) or combination of multiple account(s) and tags: You can also create Cost Centers based on account(s) and customize them based on multiple grouping of tag keys. You can create a cost center group such as account1->team1->role1. Let’s say you have different nomenclature for the same tag-keys such as user:TEAM, user:team, user:Team, then you can multi-select these tags and get complete clarity on your cost center group. Please note that you can only choose one option at a time. You cannot have a few cost centers created based on tags and few on account and tags combination. How to set, track and monitor the budget? Budget Goal: Botmetric budgeting enables the financial leader to define a budget goal for the entire payer account as per his estimations for the financial year. 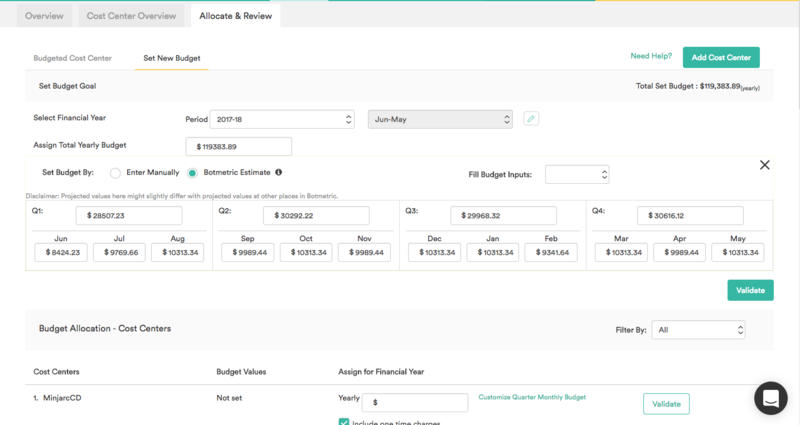 You can either enter the budget inputs manually or you can use Botmetric’s estimate to populate the budget inputs across months, quarter and year. Botmetric looks at the data for the last 12 months for yearly budget tracking. Based on your company size it can take upto 72 hours of time to enable, process and crunch your data. Assigning Budget to Individual Cost Center: Individual Cost Center owner(s) or financial admin(s) can set/edit budget goals for their respective units. The owner or financial admin(s) can either enter the budget inputs manually or make use of Botmetric’s estimate to populate the budget inputs across months, quarter and year. If a non financial admin or user is creating the budget for his Cost Center, it will be sent to a financial admin for approval. The new roles provided for Budgeting are helpful for providing clear demarcation between users and financial admin(s). This will allow financial admin(s) to have control over the approval of budget while providing enough flexibility to the other roles to manage their Cost Centers effectively. Botmetric’s Budgeting Overview provides a summarised view where you can see a snapshot of your financial year performance at the payer account level. You can compare the actual, allocated and projected spends for the current month, current quarter and financial year. You can alse see a list of top spending Cost Centers for the current month and current quarter. Moreover, a complete trend graph comparing your actual, allocated and budgeted spend performance at a payer account level for 12 months and 4 quarters will help you evaluate Budgeting with a quick glance. Botmetric’s Cost Center Overview provides a comprehensive view to track the performance for each Cost Center. Fine grained resources and service details provide a deeper and instantaneous understanding of where a certain Cost Center is incurring more cost. Ability to shuffle the view among monthly, quarterly and yearly options will allow the user to understand the budget variance over time. Each Cost Center will be evaluated to determine whether its incurred cost is within the allocated budget or it has exceeded the defined budget limit. Moreover, each Cost Center has a corresponding budget trend graph to show the comparison between actual, allocated and estimated spend. If you have a huge list of Cost Centers in your cloud, the search bar will help you to quickly find the desired Cost Center. 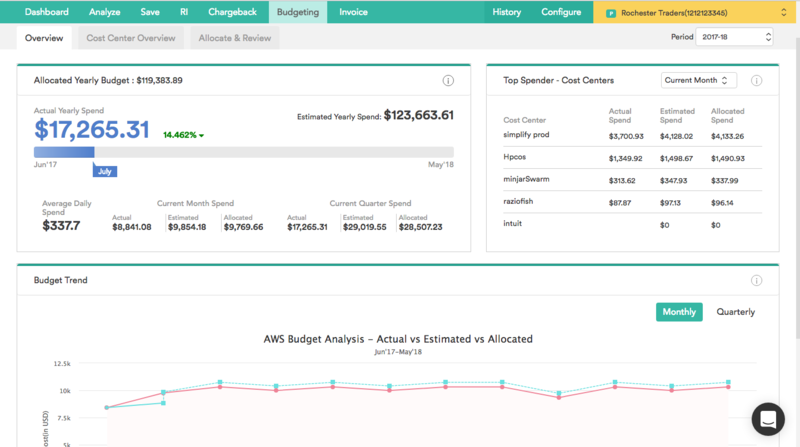 Botmetric’s Enterprise Budgeting will empower IT budget owners to define and track budgets at every granular level. This will also streamline budget processes in your organization and bring composure in the chaotic world of budget goals setting. Signup for 14 days free trial and check how it can help your organisation in cloud cost saving.